Property services company Savills Vietnam believes that growing foreign direct investment and moving up in the value chain mean Vietnam’s industrial real estate sector has a bright future. When it comes to the regions arts, culture, and history it seems it is the grisly past that appeals the most to Asean visitors. The regions two most popular museums being testimony to war, pain, death, and destruction. Export value of the FDI sector in the first ten months of 2018 reached US$142.8 billion, up 14.9% year-on-year or US$18.49 billion, accounting for 70.7% of Vietnam`s total export value. It is expected that around VND391 trillion (US$16.76 billion) of credit could flow into the economy in the last quarter of 2018, which will be enough to meet the entire demand of the economy in the remaining months. With Vietnam’s economy growing rapidly, the need for a business concept called “mini storage” is rising. Reasons enough for Hanoi’s first self-storage company, KingKho, to open for business. The misconceptions about transfer pricing being a tax avoidance or violation in Viet Nam are creating challenges for multinational enterprises, said Adam Sitkoff, executive director of the American Chamber of Commerce in Viet Nam (Amcham). Excellent ideas and clear business models have been produced by contestants, say organizers of the Startup Viet 2018 contest. The Blue Venture Awards, a contest for social entrepreneurs, was launched in HCM City on November 6 to promote development of social enterprises and help solve social and environmental problems in the community. At the current rate, Vietnam ranked third in Asia in terms of beer volume consumed in 2017, only behind Japan and China, and topped Southeast Asia. Developing eco-industrial parks would help Viet Nam attract foreign direct investment and promote sustainable growth. Some provinces have called for preferential solar power prices to be extended to the end of 2020 instead of June 30, 2019. Customs inspections paperwork will be reduced, while procedures and services will be improved to aid firms’ operational activities, experts said during a November 9 conference in HCM City. The liberalization of the retail market has made Vietnam more attractive in the eyes of investors. With few customers, five airports in different regions of Vietnam close at sunset because they do not have runway lights. Ms. Le Hoang Diep Thao, co-founder of Trung Nguyen Group and founder of King Coffee brand, joins the Allegra Coffee World CEO Forum to share the remarkable story of the Vietnamese coffee industry. Moody’s Investors Service (Moody’s) has changed its 12-18 month outlook on the banking system in Vietnam (Ba3 stable) to stable from positive. The Ministry of Industry and Trade (MOIT) held a ceremony in Hanoi on November 10 to transfer the rights of State representatives at six groups and corporations to the Committee for Management of State Capital. Regular expenses are too high and many expenditure items are unnecessary: these are comments regularly seen in reports about the state budget. The leaders of Vietnam and Cuba on Friday pledged to deepen relations between two of the world’s few remaining communist countries. The Vietnam Association of Seafood Exporters and Producers (VASEP) said a delegation from the European Parliament (EP)’s Committee on Fisheries visited Hanoi and coastal provinces from October 28 to November 2 to examine Vietnam’s efforts to fight illegal, unreported, and unregulated fishing (IUU). More than 56 percent of banks recruited new workers in Q3, but 26.6 percent said they still lacked workers, while more than 61 percent of banks planned to recruit more workers in the fourth quarter, a report says. The Tien Phong Commercial Joint Stock Bank (TPBank) has become the first bank in Vietnam to allow cardless cash withdrawals using a QR Code at both its ATMs and Livebank service, according to a report from the Vietnam News Agency. Over the years, Ho Chi Minh City’s economy has been continuously growing at a high level, contributing significantly to the development of the country. Two Vietnamese workers were killed and two others injured in an explosion at a chemical plant in Wonju city, the east of the Republic of Korea (RoK), on Saturday. 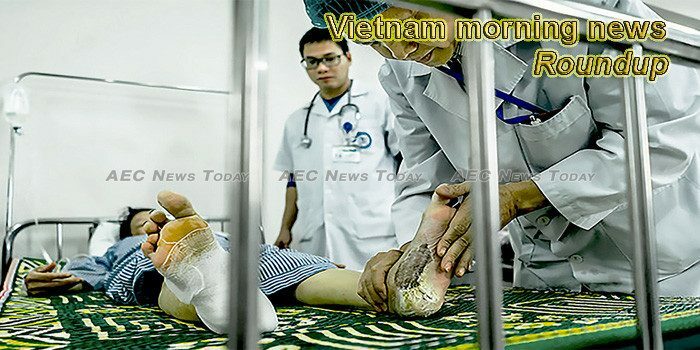 This week’s Vietnam morning news feature photo acknowledges World Diabetes Day, November 14.